The latest and definitely the best way of connecting AV equipment. HDMI leads and cables can carry Audio and Video without interference, and at a bandwidth of up to 5gb/sec optionally with 3D support and Ethernet over HDMI so you can have active smart Tvs without needing a separate network connection; if you can use it, do – it is almost future proof! HDMI (High Definition Multimedia Interface) is a specification that combines video and audio into a single digital interface for use with Blu-Ray players, games consoles (Xbox 360, Xbox One, PS3, PS4 etc.) DVD players, digital television (DTV) players, set-top boxes, and other audiovisual devices. 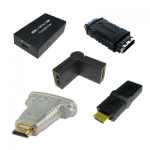 At Leads Direct we offer a wide range of HDMI leads and HDMI accessories, including angled connectors and swivel connectors for use in a tight spot, HDMI couplers, HDMI Extension leads and the latest spec cables. If you can’t find what you’re looking for feel free to Contact Us, we’re happy to help! 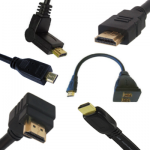 If you need more information on HDMI leads you can find detailed information in our Technical Library on our HDMI Wiring page.